Depuis l'indépendance, en 1975, le gouvernement des Comores a connu plusieurs coups d'État. Le plus récent était dirigé contre le gouvernement de Saïd Mohamed Djohar, chef de la Cour suprême, élu président en 1990. Après les élections, la crise économique et l'agitation politique ravagèrent le pays, qui connut alors plusieurs tentatives de renversement. Les élections de 1993 furent marquées par la violence. En 1994, Djohar nomma Halifa Houmadi Premier ministre, dans l'espoir de stabiliser le pays. Houmadi chercha à obtenir une aide internationale afin de verser les salaires aux fonctionnaires en grève et de résoudre les problèmes provoqués par les mouvements sécessionnistes et les opposants au régime. Le 28 septembre 1995, le mercenaire français Bob Denard (connu pour ses multiples interventions militaires en Afrique et soupçonné d'avoir participé à l'assassinat de l'ex-président comorien Ahmed Abdallah, en 1989) et ses hommes attaquèrent le palais présidentiel à Moroni, et prirent le président Djohar en otage. Ils s'emparèrent de l'aéroport et relâchèrent tous les détenus de la prison de Moroni, parmi lesquels se trouvaient des complices ayant joué un rôle dans la tentative de coup d'État de 1992, fomentée par le même Bob Denard. Cette opération constituait sa quatrième tentative pour renverser le gouvernement des Comores. Cependant, le gouvernement français décida d'intervenir et les rebelles se rendirent aux militaires le 5 octobre Denard fut extradé vers la France, où il est poursuivi par la justice. Après l'intervention française et en vue d'une futures élection présidentielle, le Premier ministre comorien, Mohamed Caabi El Yachroutu, annonça un nouveau gouvernement de coalition qui mit fin au régime de Djohar. Ce nouveau gouvernement, dirigé par El Yachroutu, était formé des membres du précédent parti au pouvoir – à l'exception de Djohar – et d'un petit nombre de dirigeants de l'opposition. A la suite de l'élection de mars 1996, Mohamed Taki fut désigné président. One of the more successful attempts was made by Bordeaux native Bob Denard who actually managed to run the Comoros Islands between 1978 and 1989. The Comoros are an Indian Ocean island group just northwest of Madagascar. The major export of the long forgotten islands is ylang-ylang, a rare flower used in the production of aromatic oils. On May 13, 1978, 49-year-old Denard landed with 46 men in a converted trawler named the Massiwa. He had sailed from Europe with his black uniformed crew to claim ownership of this tiny but idyllic group of islands. 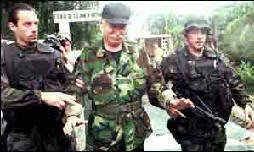 Denard had been here before to train the soldiers of Marxist ruler Ali Soilih. Soilih was busy kicking out Ahmed Abdallah. Abdallah fled to Paris and later, short on funds but high on ambition, offered to cut Denard in on the deal if he would return him to power. The deal was rumored to be worth $6 million. Denard enjoyed his new role as "man who would be king." Soilih was a young despot who appointed a 15 year old to run the police department, burnt all government records, and after a witch doctor told him he would be killed by a white man with a black dog, he killed every black dog on the island. Abdallah took all the political heat as his puppet. Denard, a former vacuum cleaner salesman and policeman, had seen what a few trained soldiers could do in his various adventures as a mercenary in Katanga, Yemen and Benin. This time he was in charge. He landed quietly at night and proceeded to the palace to find Soilih in bed. He shot him, and the next morning drove through town with Soilih's body draped over the hood. Denard had with him a black Alsatian. The crowds cheered and Denard became an able leader of the Comoros for 11 years with 12 other white mercenaries. He took a Comoran wife, bought a villa, converted to Islam and became Said Mustapha Madjoub. During his reign, South Africa used the Comoros to ship arms to Iraq and monitor ANC training camps in Tanzania, the French used his islands to ship arms to the right wing Renamo guerillas. Finally after he (or someone else) shot the puppet ruler Abdallah in a heated argument, the tide turned against Denard. His presence angered the other African states to such a degree that the French arranged for Denard's resignation in 1989. Denard, disappointed and back in South Africa, spent his evenings planning his return to paradise. Sounds like a great premise for a sequel. They say sequels are never as interesting as the originals, and, in this case, they're right. Remember Bob Denard. It seems that staring out the window got to be too much for him, so at the crusty old age of 66, Denard decided to give it one more go. On October 4, 1995, Denard and a group of 33 mercenaries (mostly French) rented a creaking fishing trawler and sailed back to the Comoros to recapture his little Garden of Eden where he had been King (actually, head of the Presidential Guard, watching over a puppet ruler) from 1978-1989. They landed at night and quickly sprung their old buddies out of the islands' main jail; then they captured the two airports, the radio station and the barracks. After that, they rousted the doddering, 80-something Said Mohamed Djohar out of bed. By morning, Denard was on top and Djohar was a criminal charged with misrule and stealing government funds. Two days later, the French government landed 600 troops and after a brief but halfhearted fight, the mercenaries were rounded up and Denard was shipped to France where he will be tried and jailed to keep him from island hopping again.